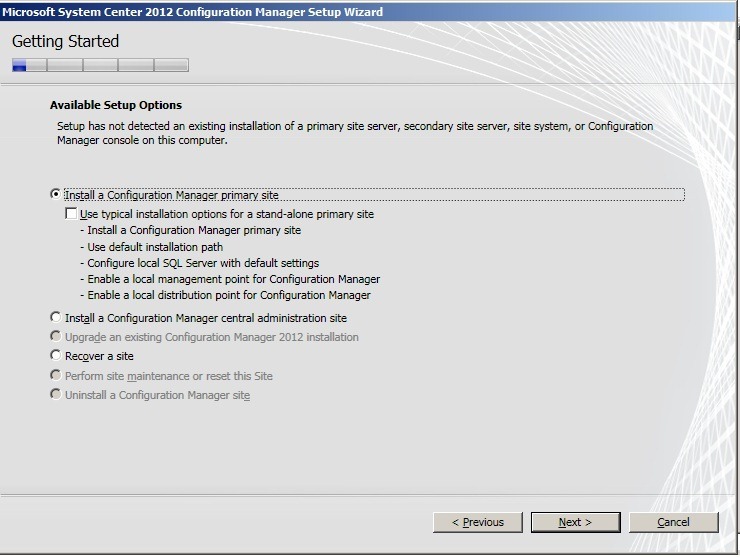 SCCM 2012 part 3, client configuration. 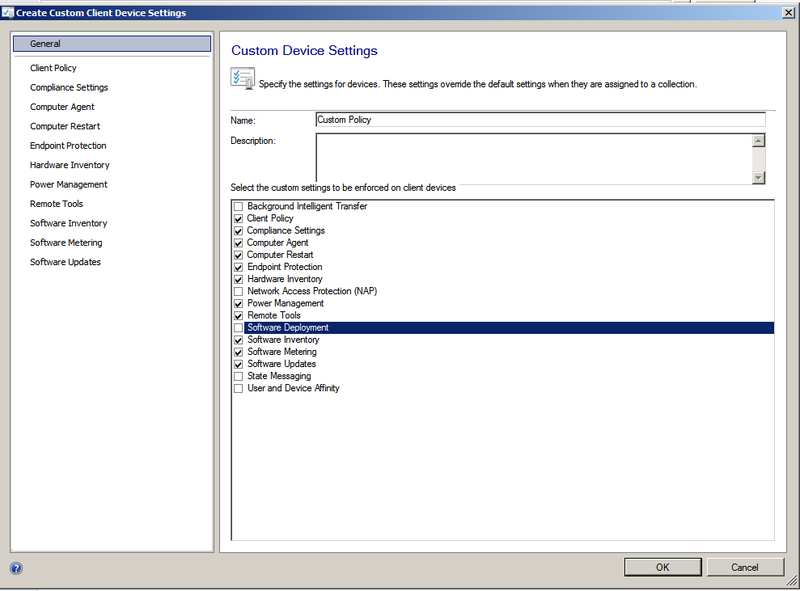 Remember that you can have multiple client settings, since we are going to create a new dynamic collection, we can click the button on the top menu called Create Custom Client Device Settings, in pop-up window that appears we have the option to choose what we want this new policy to include. 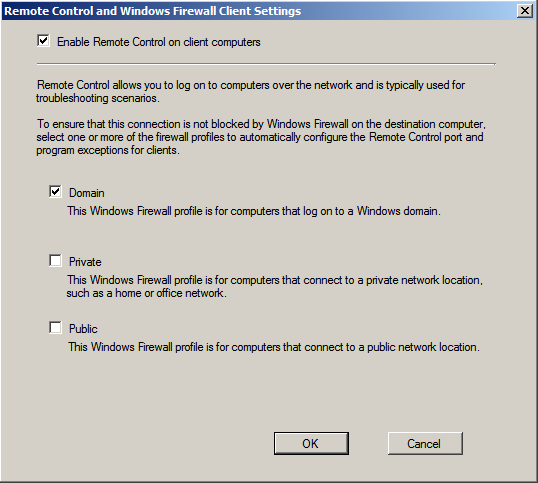 So if we don’t choose for instance “Network Access Protection” , that client will then get the “Network Access Protection” info from the Default client settings. But you can also see that the Default Client Settings has a priority of 10 000, so If I were to create a NAP policy which has the priority of 10, then that policy would override the default one. We can start by looking at the Client Policy, this is were you define how often the client should do a policy refresh against the site ( As you can see its 60 min by default, and on internet facing clients it is disabled until they are back on the lan ) Im going to tune that down to 15 min (Since this site will only have a few clients ) Remember that by lowering this will cause a large increase on data to your site so don’t overdo it! Next is Computer Agent, most of the Client settings are put here. Here we define our Deployment deadlines, and we define the URL of the application catalog (Since this is already installed on the same server, I’ve just set that to automatically detect, and remember to set the “add default app…. to trusted sites” to True so you don’t encounter any issues regarding the portal. 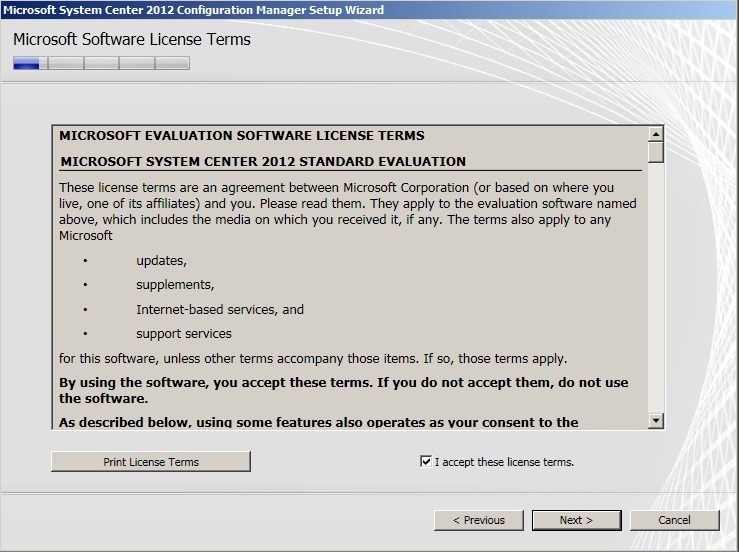 And If you want the users to have permission to install software we set that value to true. Now next to computer restart, just leave that to the default. As you can see here, the options are greyed out… Why ? Because we forgot to install the Endpoint protection rule, so we have to install that after, but lets finish the policy first. (Then we will go back and alter the Endpoint policies ) Hardware inventory this is enabled by default, but we should double-check and se if we want it to report more or less. 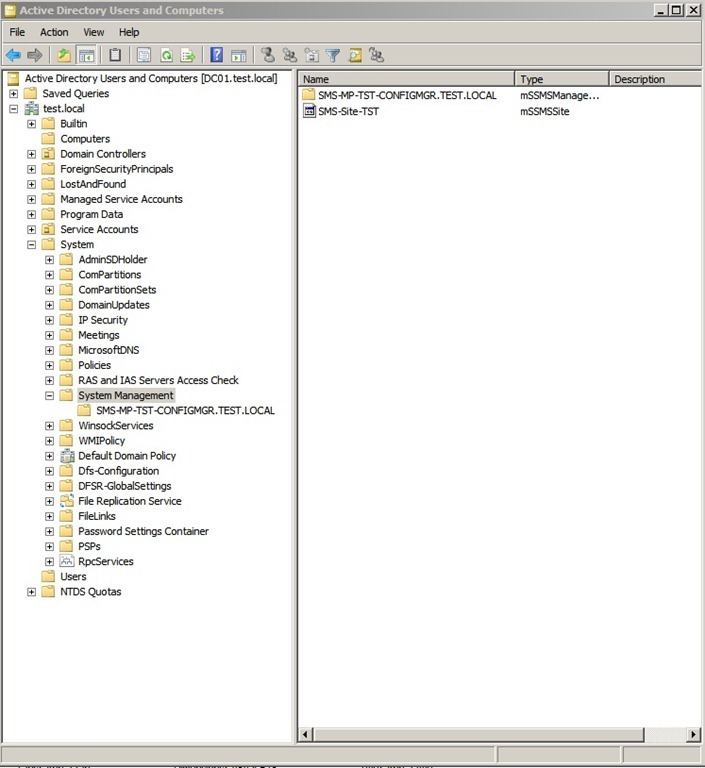 So push on the “Set classes” The list that you see here is what the ConfigMgr agent will report back to the site regarding hardware. So if you want the Agent to report more regarding hardware just mark the class you want info on. In my case I want the agent to report back if it has a TPM (Trusted Platform Module) chip so I mark that and press OK.
Next we have power management, which basically does is enable power management on the client. 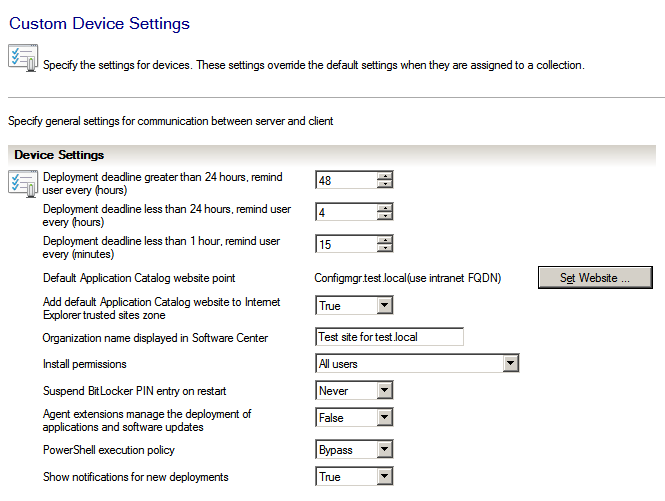 And/Or allows your users to exclude their clients from power management. We will get back to that later. So let this stay at the default, so we go into Remote Tools. But lets start with the first option, enabling Remote Control. Next I add myself as a Remotr control and Remote Assitance viewer and change any other settings I wish. Software inventory, enables the agent to collect information about software installed on the clients. since this covers most of the applications that I want. concurrent license usage. 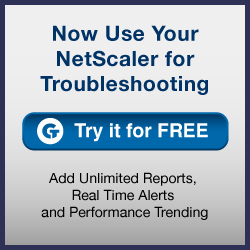 This option just enables software metering on clients. Software Updates, allows the agent to do software update on the clients, just leave this at the default. 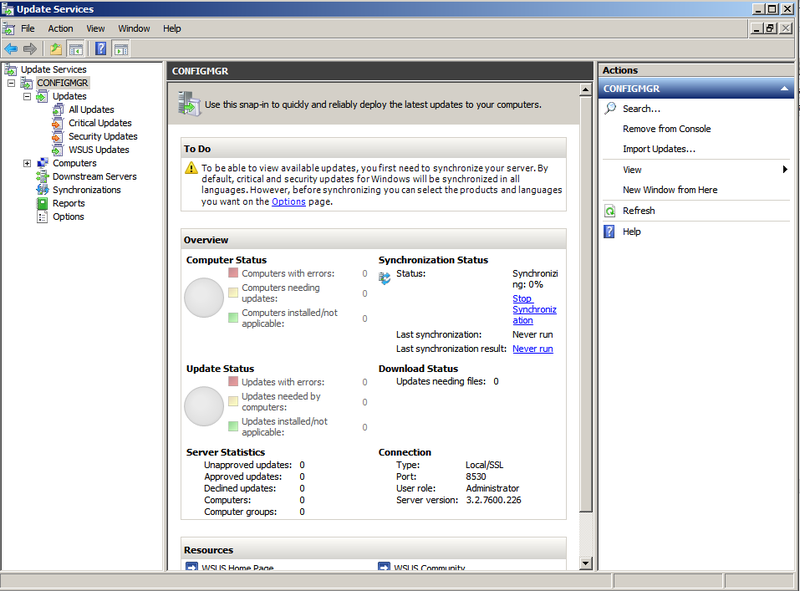 Now that we have gone trough the policy settings, click OK and we get back to the Console. computers before it is actually used. So now we can go to create the dynamic computer collection. 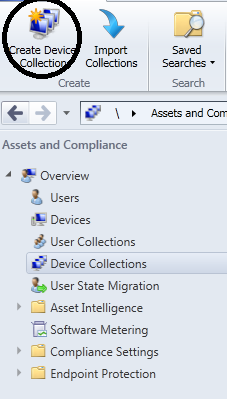 Device Collection -> there you have the option to create a new device collection. Click next, and here is were we choose a query rule. 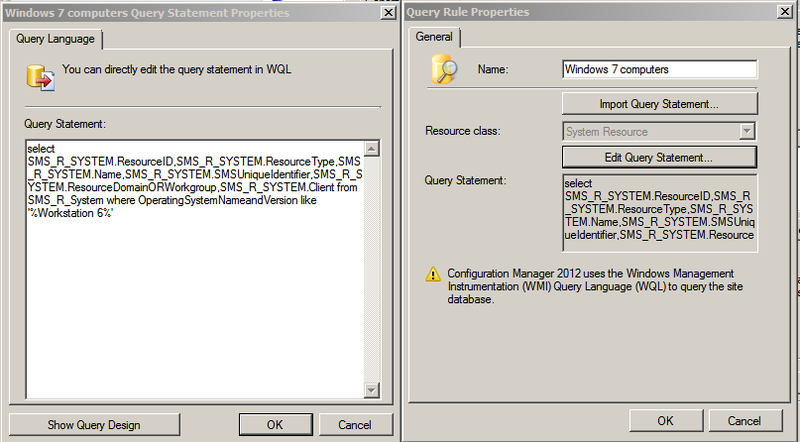 In the query rule , we can enter this query. Tthis query will only include workstation computers that have version 6%. FYI you have tons of options regarding queries here. 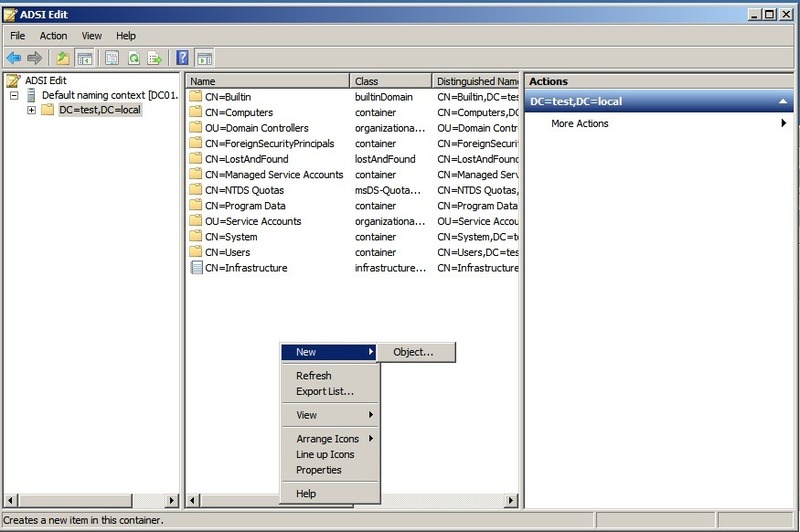 You can for instance, create a dynamic collection that checks if the client has Office installed, if it hasn’t it will join that collection you create and you can have office as a required software deployment for that collection, and when the application is installed and the next time the query is run the computer is going to be removed from that collection. Now we can just finish the Query wizard, and create the collection. So now we turn to the client. 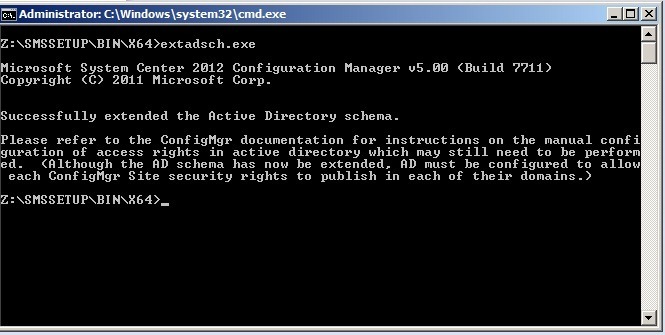 We can install the client manually, group policy, push install via console. For this demo we are going to use the client push. I just want to include that if you are going to install the client manually you have a lot of parameters available. 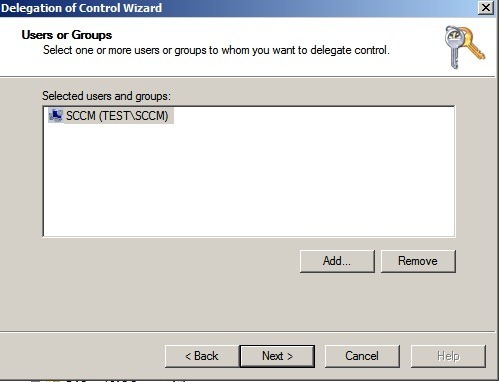 For instance if you haven’t expanded the AD schema with the SCCM update, you will need to add the parameter ccmsetup.exe /MP:10.0.0.0(IP) SMSSITECODE=TST (If you set the SMSSITECODE=AUTO) It will try to get the site code from AD. 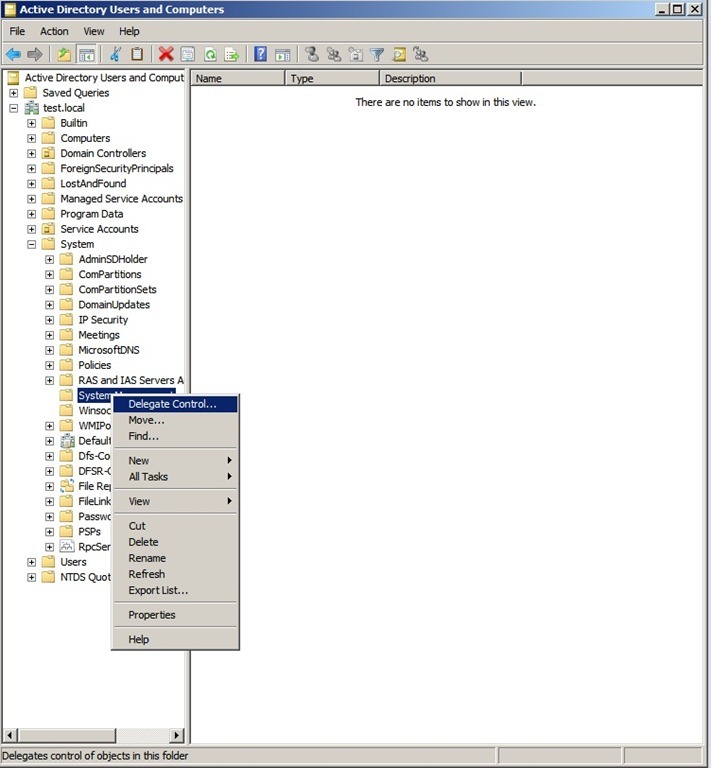 So ill just add my Windows 7 computer to the domain, and the AD sync will automatically add it to the SITE. As you can see it appears in the collection. It also says Site code = TST even thou I haven’t installed the client yet, why ? Because this computer is part of the TST boundary. 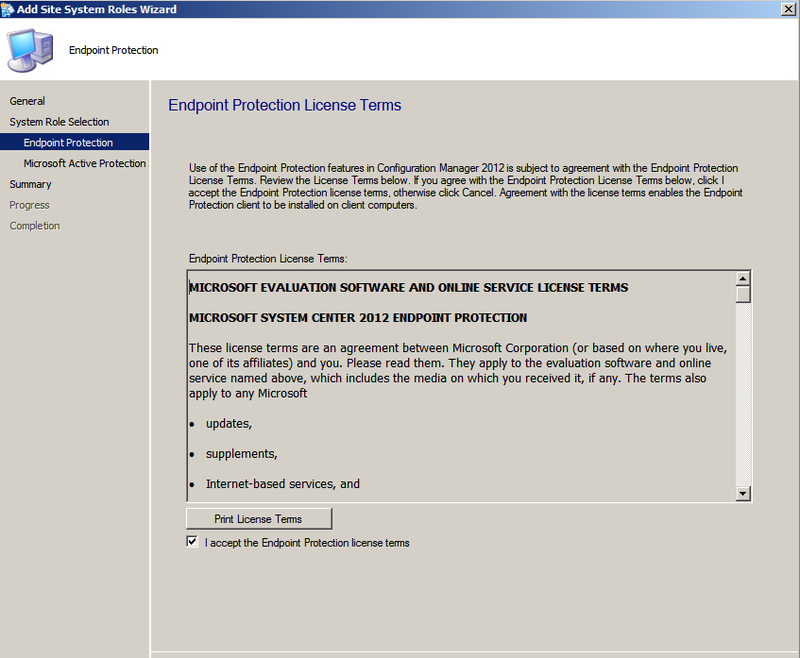 Now before we install we need to install the Endpoint protection role. 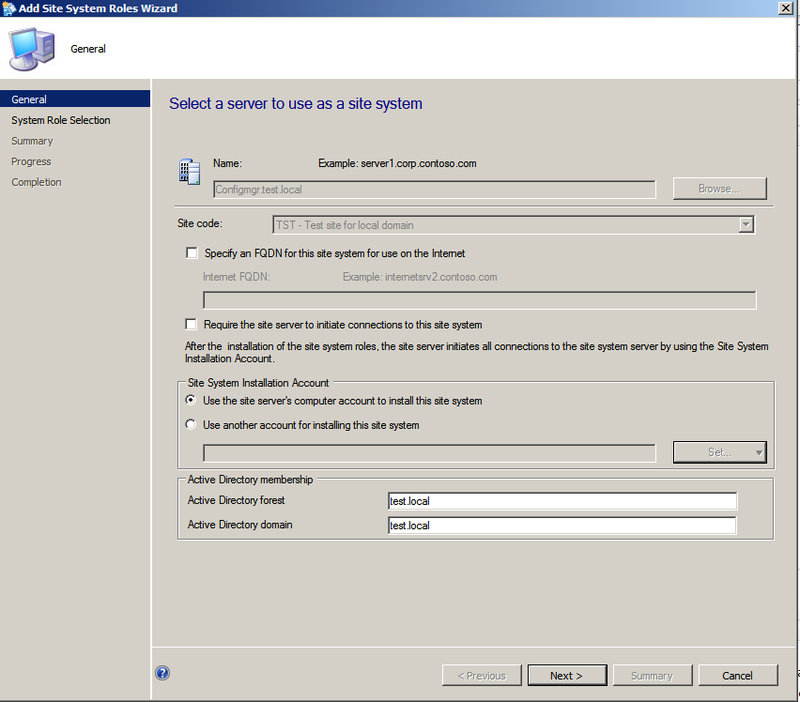 So go to the administration –> Servers and site system roles –> right click on your primary server and choose add site system role. 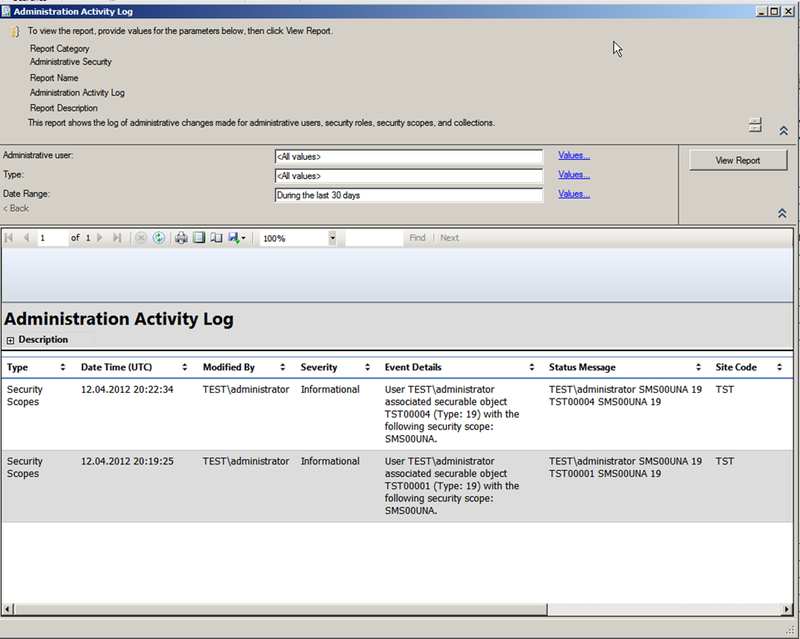 Then we choose the Endpoint protection role. this time we can continue with the setup. Basically just accept the terms, choose “Do not join MAPS” , next , next finish. 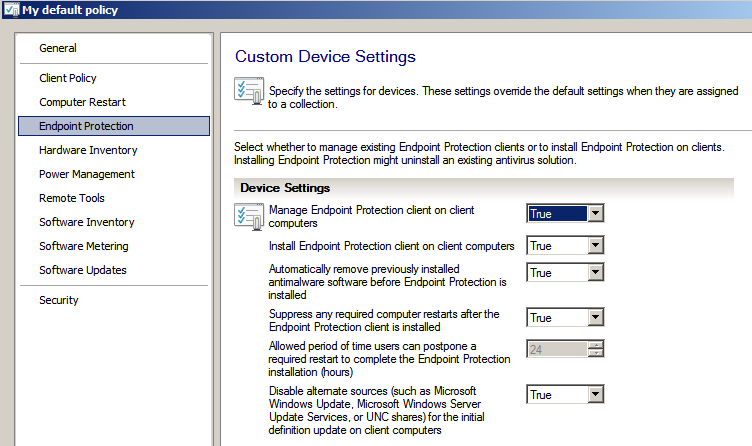 We go back to the Client policy settings we created and alter the “Endpoint Protection settings.” Choose enable on the “Manage endpoint protection client” and leave the rest to default, and choose OK.
Now, go back to the collection, right click on the client and choose install client. Mark the last part, next , next , finish. But since it doesn’t have admin access on that computer we have to give it that. After we done that, try installing the agent again. Now when you’ve done that, open task manager and choose processes on the client. You can now see that its trying to install the agent. If you want to check the progress, there are some setup logs created in the C:\windows\ccmsetup folder. 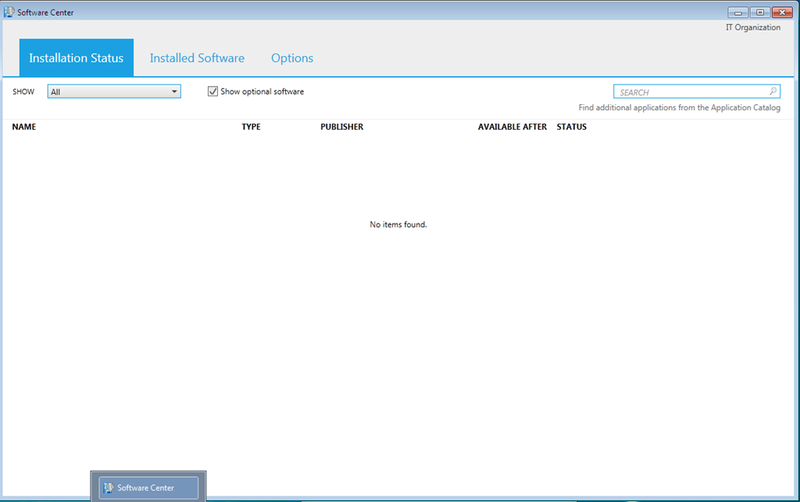 When the installation is complete you will get a new application called Software center in your start menu. 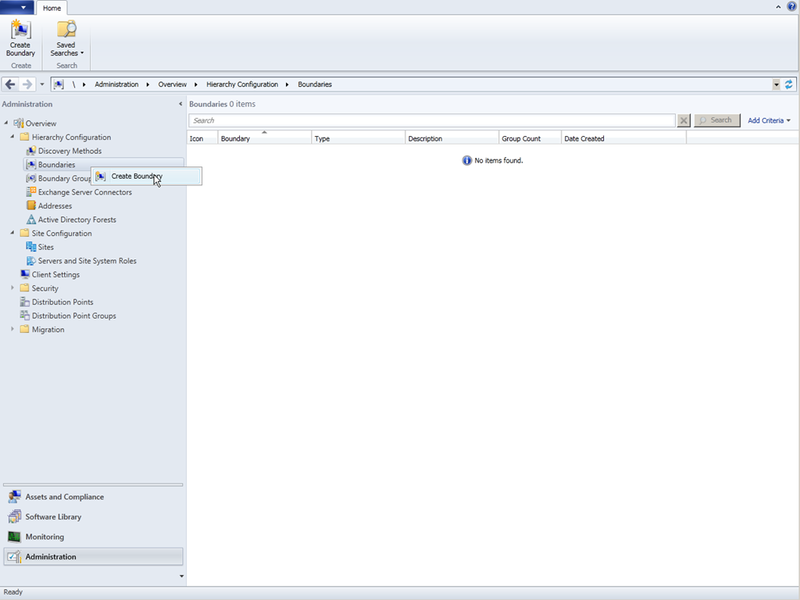 And a new option in the control panel called, Configuration Manager Properties. 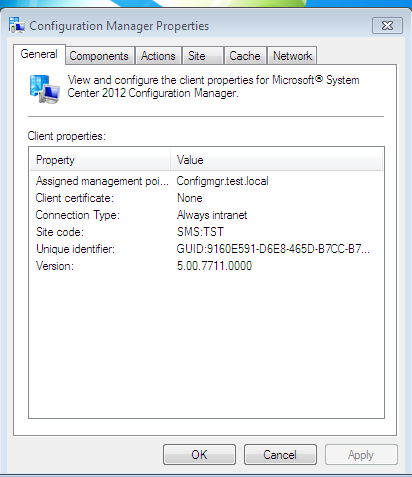 Since this just recently finished installing not all the configuration items are displaying yet (will cover that in my next post) But you can see that my agent is now connected to the MP Configmgr.test.local and assigned to the site TST. 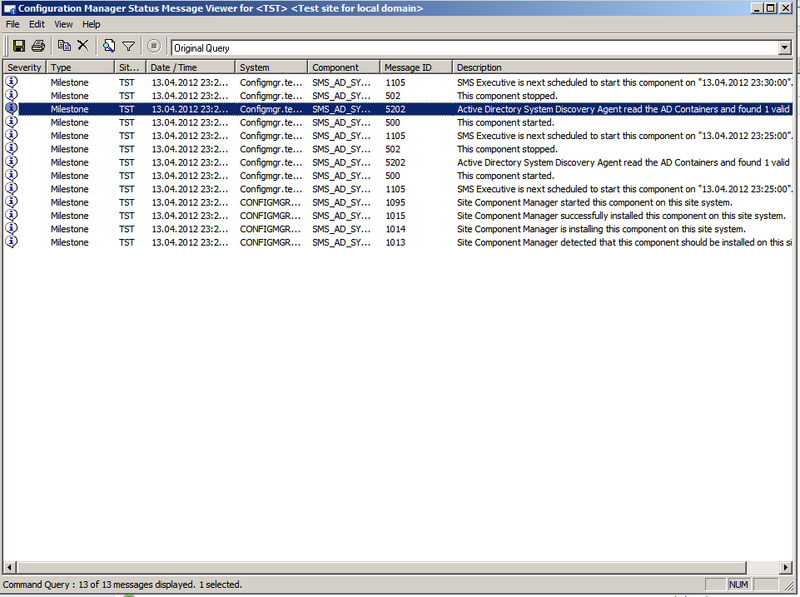 And is now appearing in my ConfigrMgr console as active. 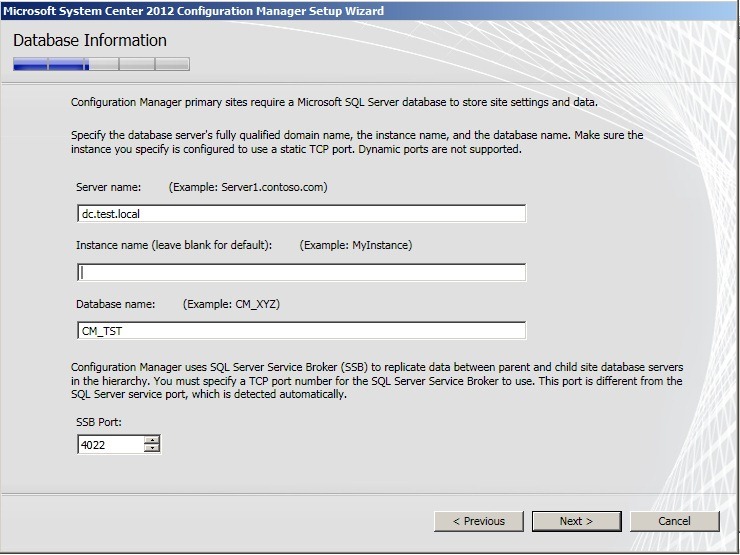 This part will consist of doing the basic configurations that make ConfigMgr 2012 actually work in a domain. 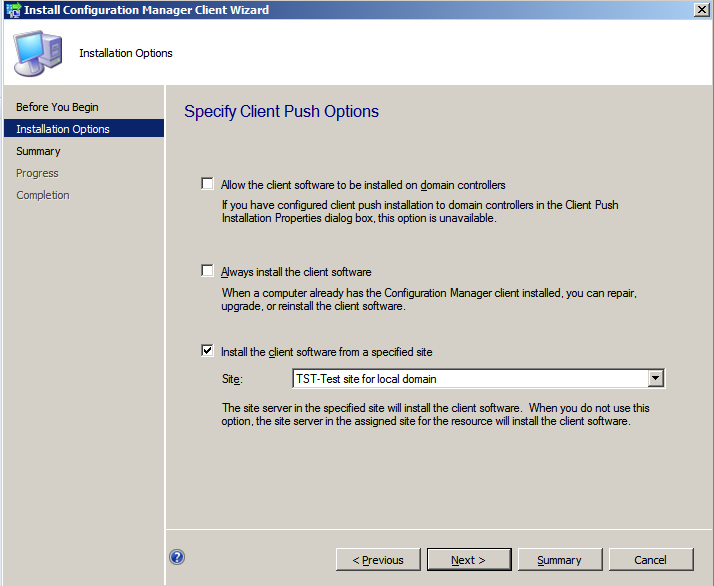 There are a couple of steps that we need to do before we can distribute the client across our domain. 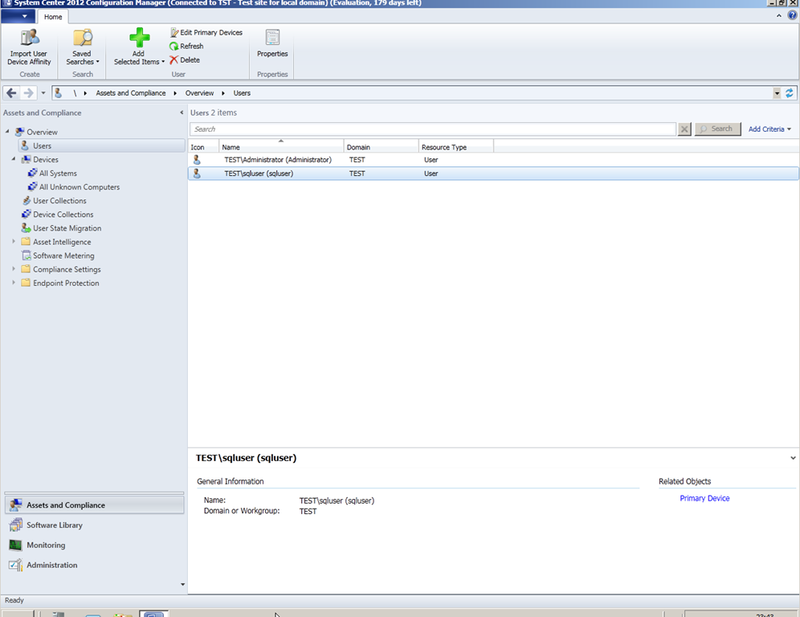 First of we can start the console ( Usually located on the desktop ) Go into the administration tab. then from the left menu select Boundaries and right click and select create boundary. the (Default-first-site-name) And give it a good description. 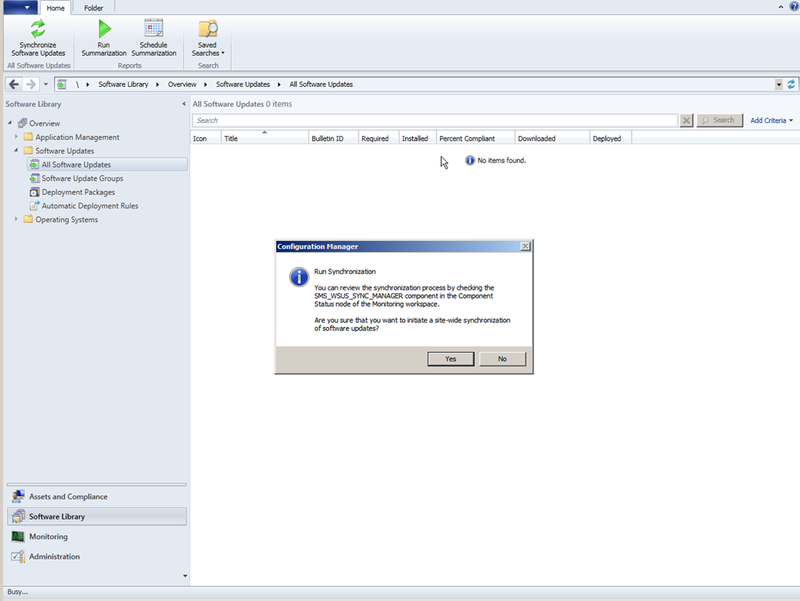 Click Apply then OK. As of now, you just created a boundary but you haven’t linked it to a ConfigMgr site so It doesn’t do much until we’ve done the rest. Next we have to create a Boundary group. Go back to the Administration –> Hierarchy Configuration –> Boundary Group. 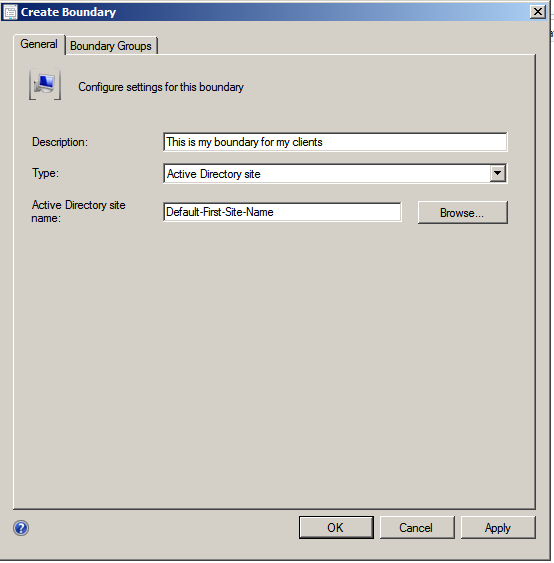 Right click and select create new boundary group. Start by giving it a valid name, adding the boundary that we created in the previous step. Then click references, then select “Use this boundary group for my site assignment”. 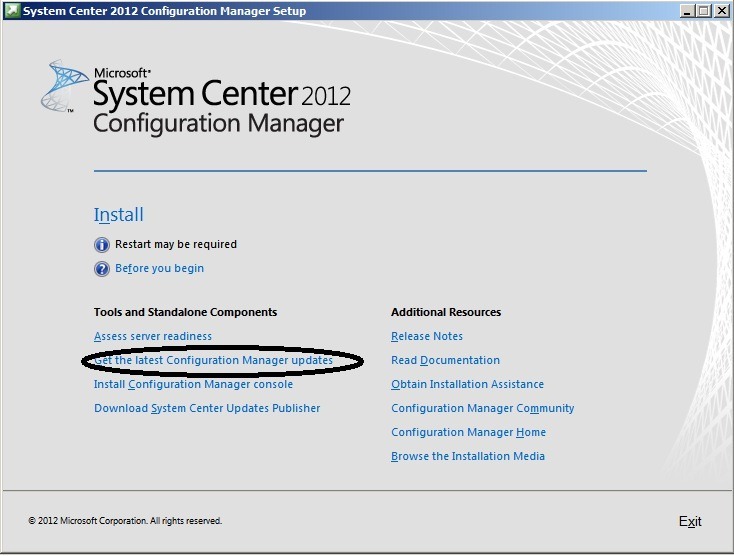 Then click the add button below and choose the site server that you’ve installed Configmgr on.Click apply and OK. If you go back to the boundary menu and choose properties of that boundary that you created ealier and go onto the “Boundary group” tab you will now see that the group is listed there. 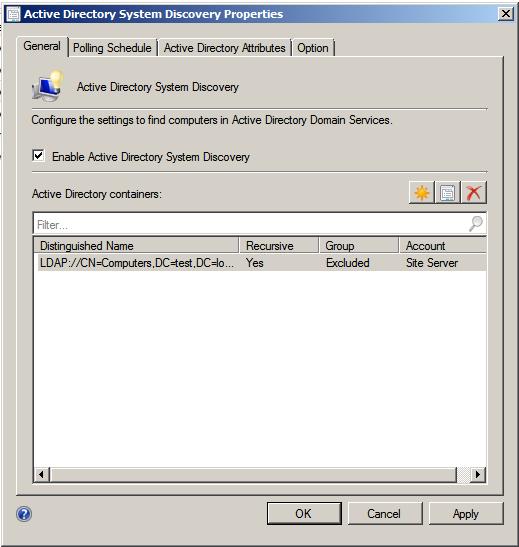 Next we have to activate Active Directory discovery, so that the configmgr system will find our users, groups and computers from AD. So Go to the Administration tab again –> Hierarchy Configuration –> Discovery Methods. 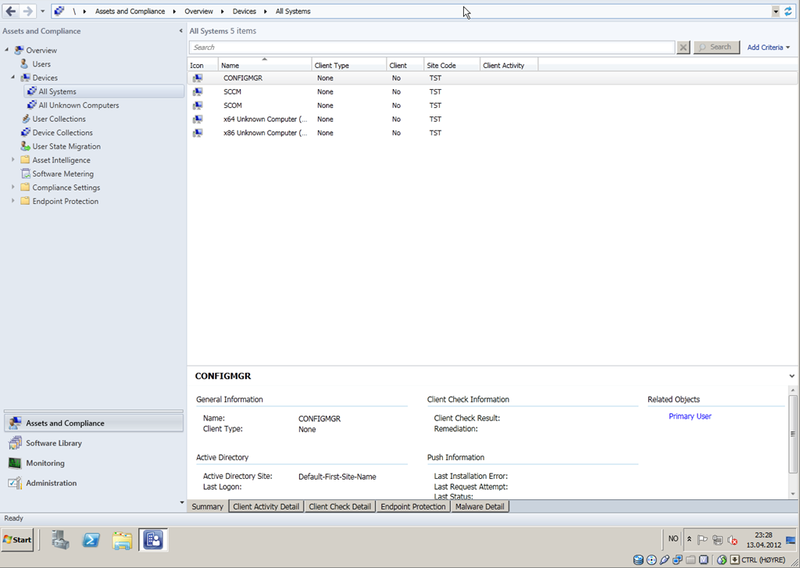 Right click on system discovery, and choose properties. 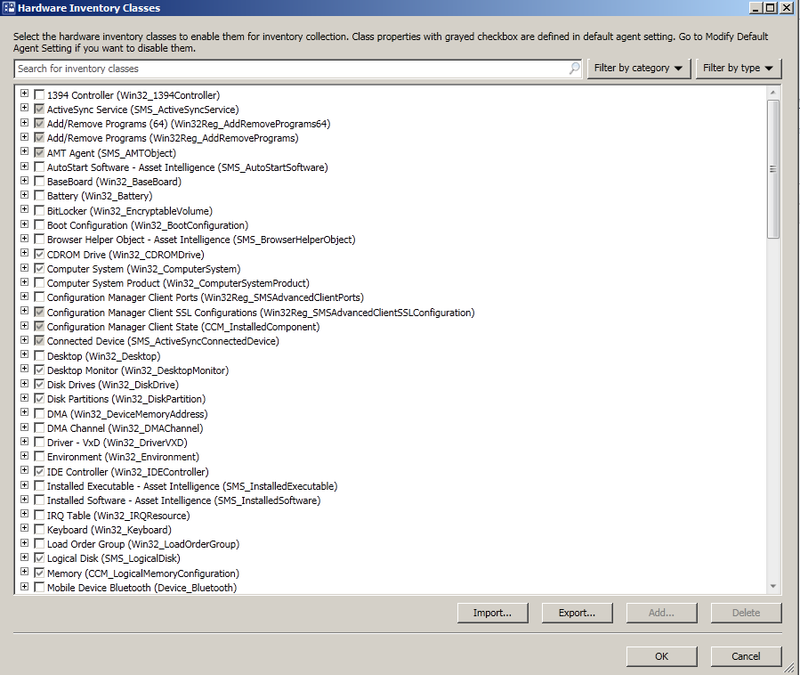 Press the enable Active Directory system discovery, then press the star button and choose browse. Then choose the OU which your clients are located, then click OK.
go to the polling schedule and change it to 1 day. Click apply, choose yes on the “Run discovery as soon as possible?” question and press OK.
show messages, all. 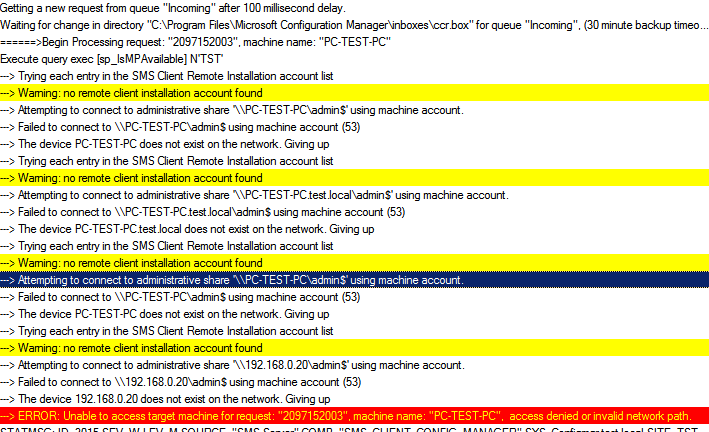 And you can see that the discovery process has already run, and according to the log it found 3 valid systems. 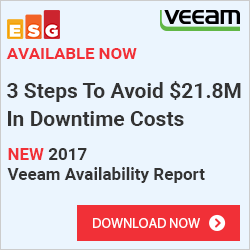 If we go into the Assets and compliance menu, then into devices, and all systems we find our 3 computers. Now we could basically just deploy our client to our computers but we are missing some other pieces that we need to put in place first. user sitting behind the computer isn’t. He/her wants his/hers software available on every computer they sit on. 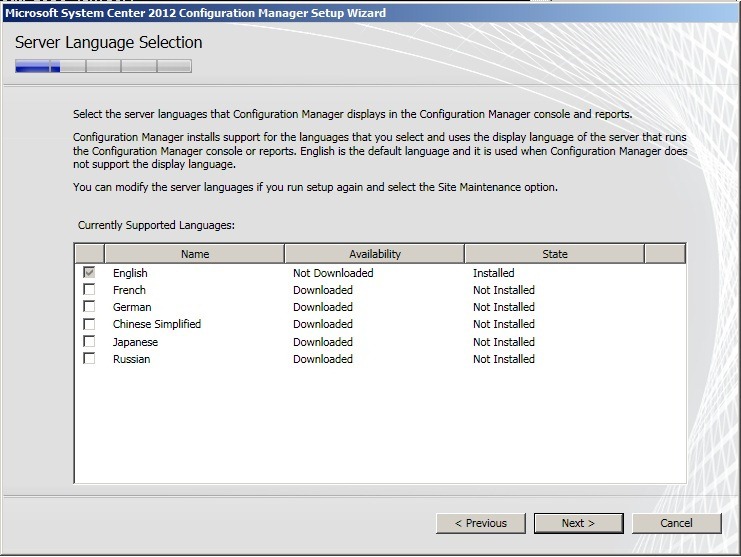 So in order to deploy software to the user, we have to import our users from AD into ConfigMgr. When you have activated the user discovery, and the process has run, your users will now appear under Assets and compliance –> Users. 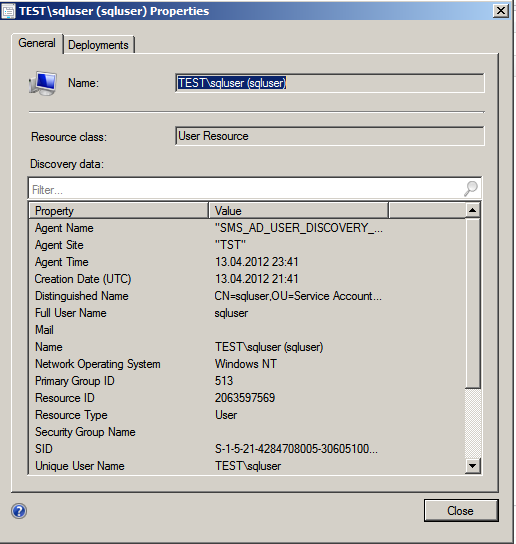 If you right-click a user and press properties you will see that it was the discovery that populated this user in to ConfigMgr. As you can see it says “SMS_AD_USER_DISCOVERY” under agent name. On the first screen that appears, just leave it as the default. Since this is not a internet facing site we don’t need to enter FQDN. And Since the computer account still has administrator access I can leave it at that. 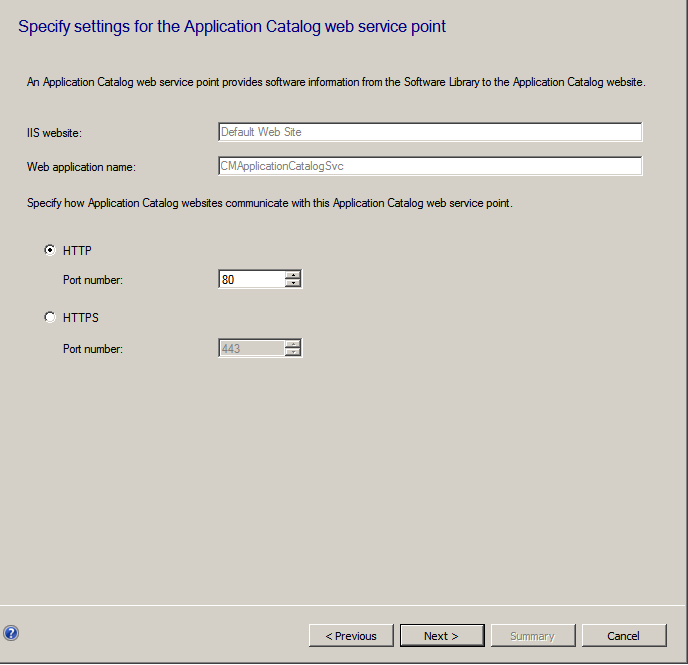 “Application Catalog Web Service Point” This is the service that the application catalog website Is going to query, if you have a large domain I suggest to install 2 servers with the application catalog website, and 1 dedicated web service point. ”Application Catalog Website Point” This is the self-service portal that users can enter to choose software that they want to install. 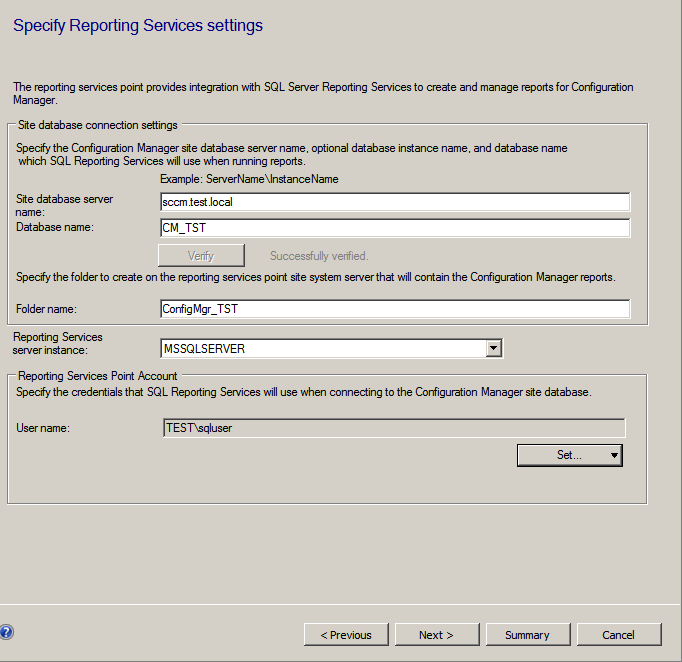 ”Reporting Services Point” Provides the communication between ConfigMgr server and the SQL reporting services server, and installing the default reports. 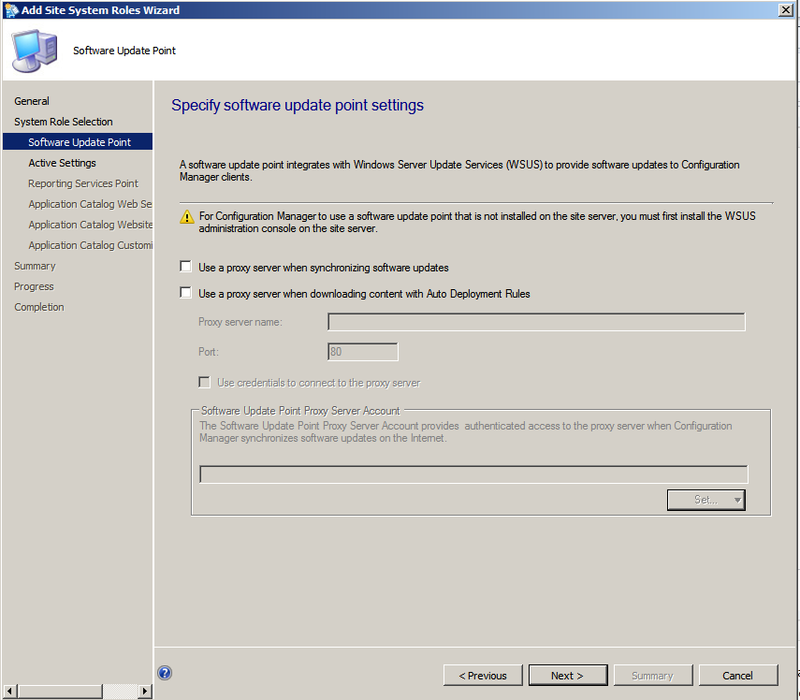 ”Software update point” Used for patching computers in the SCCM site (Requires WSUS 3.0 SP2) It also required if you wish to deploy Endpoint Protection Point, which we are going to install later. 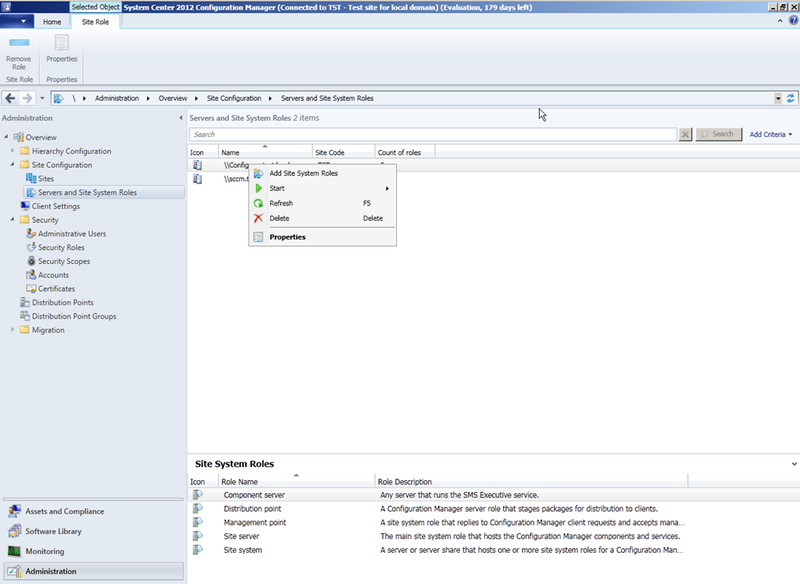 If you are uncertain start the IIS config and check the bindings to see what ports it is configured to. In my case it is a custom website, so I choose that and click next. Now in order to save a lot of screenshots, but its pretty straight forward from here. On the next pane, choose Synchronize from Microsoft Update, click next, on Synchronization Schedule leave it at the default, on Supersedence Rules leave it at default, on Classifications you choose what patches you are interested in Critical, features, service packs etc, on Products ( Choose those products you are have in your environment ot you might end up with a lot of data that you don’t need. On the Languages pane also choose those languages you have. Now that we are done with that we continue on to the Reporting Services Point. 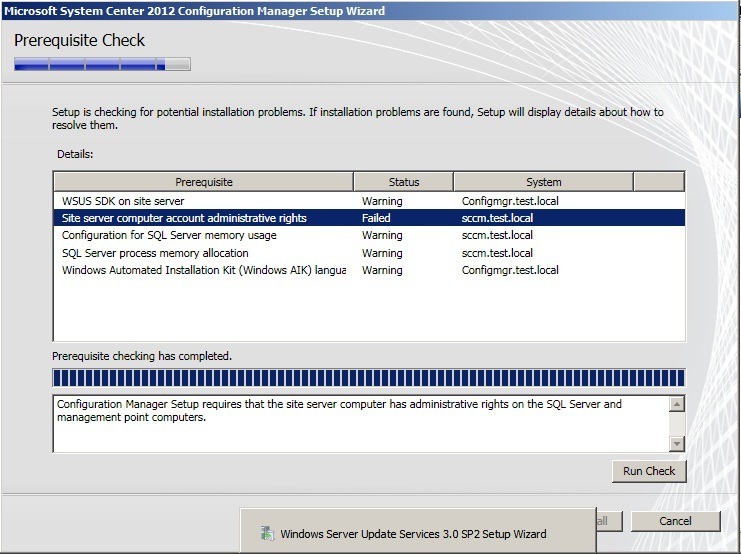 The setup automatically chooses the server which has the ConfigMgr Database installed, so click verify. 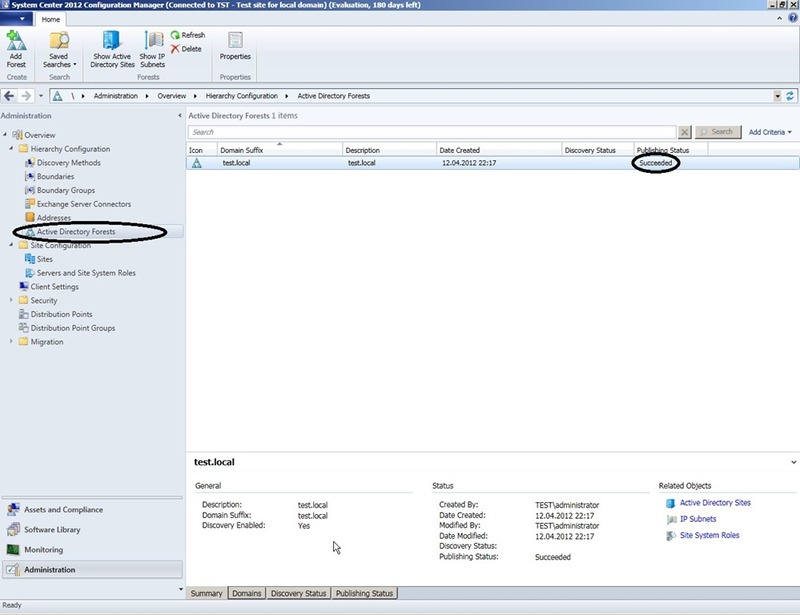 Under Reporting Services server instance, select the default instance from the drop down menu. 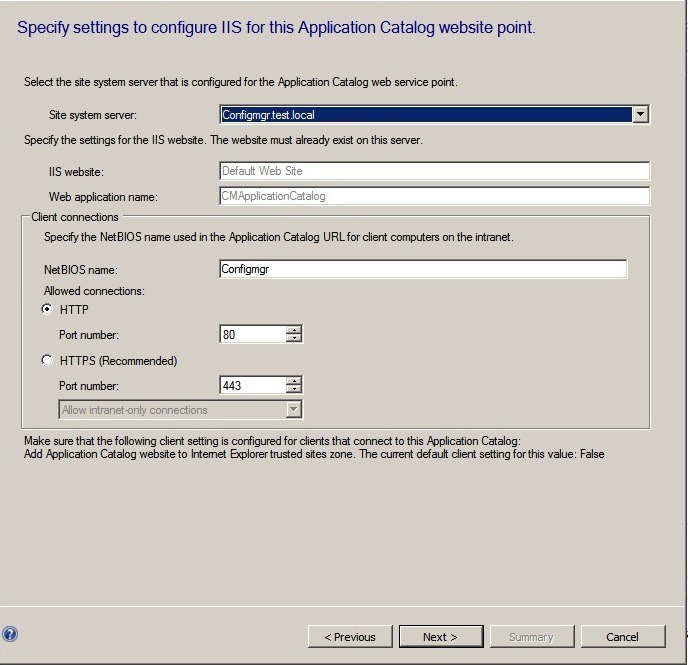 Then click next, during the Application Catalog Web Services just leave it at the default, unless you have a certificate that you want to use for https. 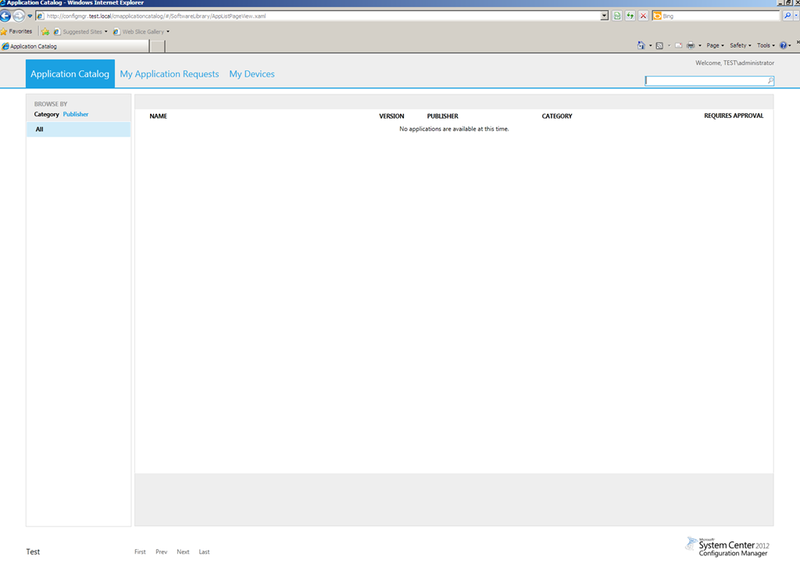 Then click next, now for the Application Web site role, just leave that also at the default. And click next and you can choose a color theme for your portal and enter a title for it. Click next, then the summary will appear then click finish. And the server roles will become installed. Now that the roles are installed, lets check that they are functioning as they should. 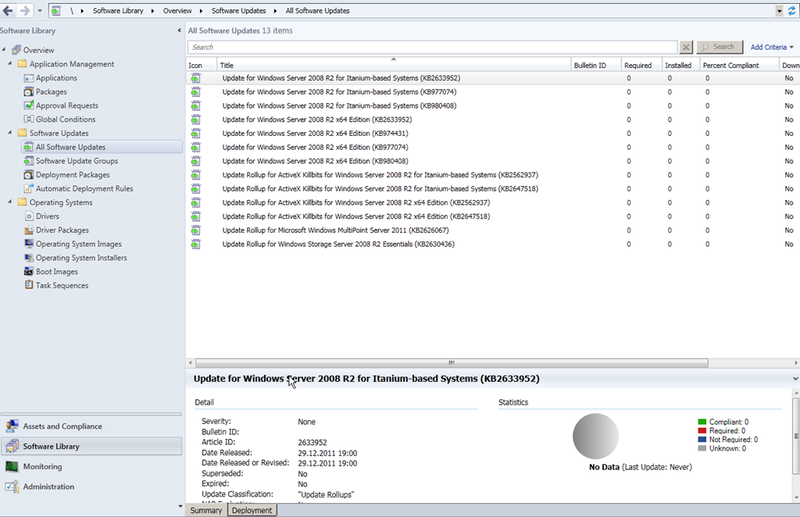 Now on to the software updating point, go into the software library –> Software updates –> right click on All Software updates and choose syncronize now. As you can see down below, it says busy. 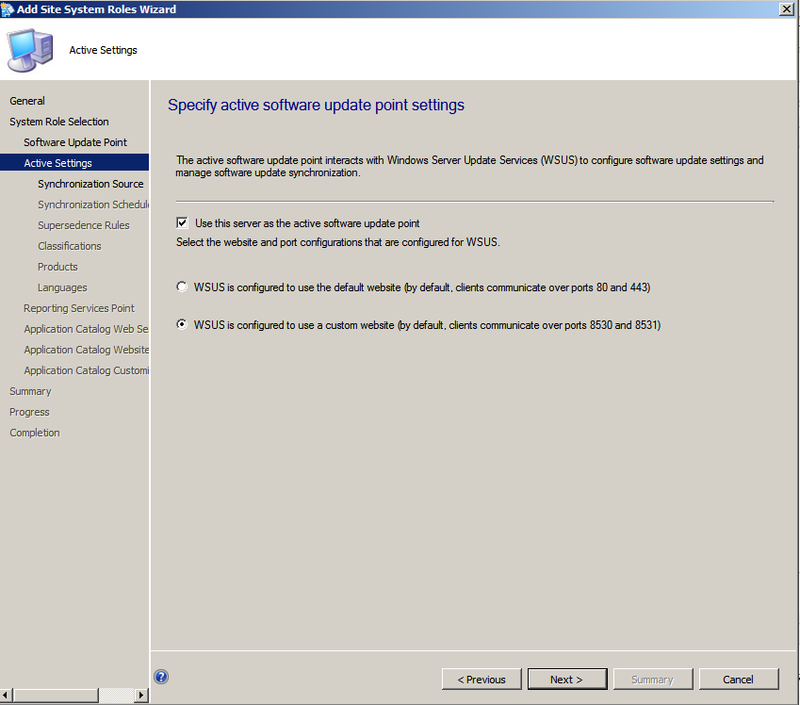 And if you open Windows Update Services console you will see that it is synchronizing. This might take some time, depending on what products and languages you choosed. As this is synchronizing, I will check that the role has been installed probably. 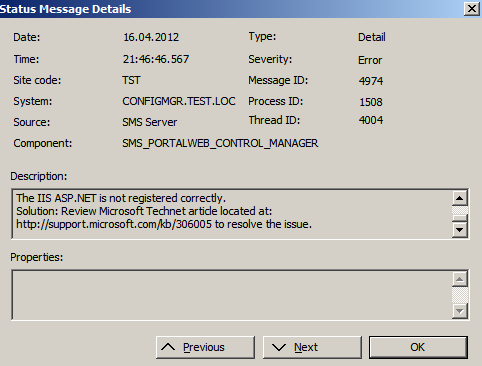 Now back to the application web portal, I get an error, I right click on SMS_PORTALWEB_CONTROL_MANAGER and choose show all messages. In order to fix this, you have to run the command, aspnet_regiis.exe –I from c:\windows\microsoft.net\framework\v4.0.30319 in CMD. Then I reinstall the Application web role from the server and volia! now It seems to be functioning as it should. 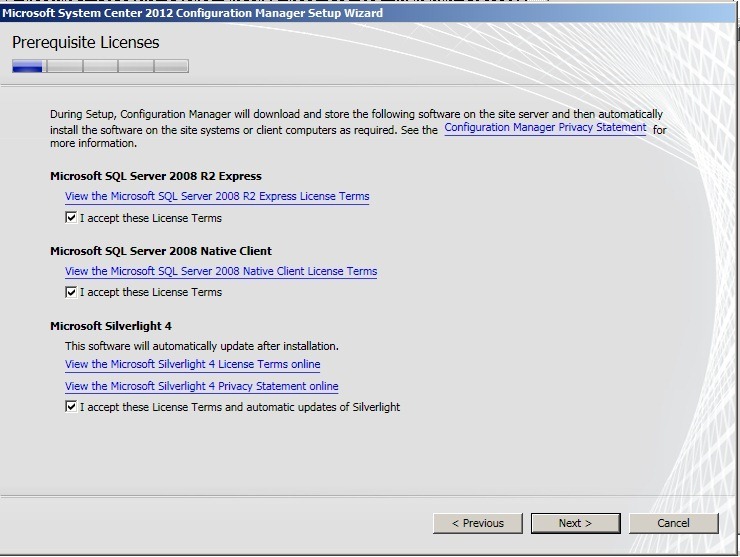 Remember that you have to have Silverlight installed in order for it to function. Voila! I haven’t created any applications that should be avalible yet. But you should always create the framework before you create the content. 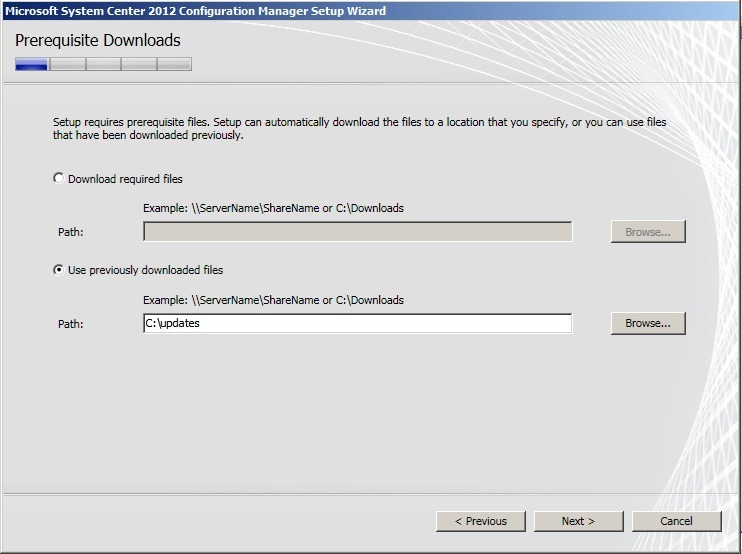 Now we are finished with part 2 of this SCCM guide, next one will focus on client settings, endpoint , software update, remote control and how to push your sccm agents out to the domain. 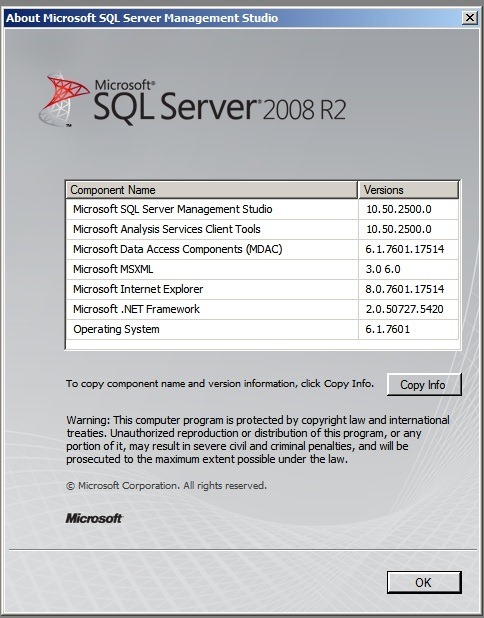 Before we start with the installation be sure to check that you have either of these versions of SQL server installed. 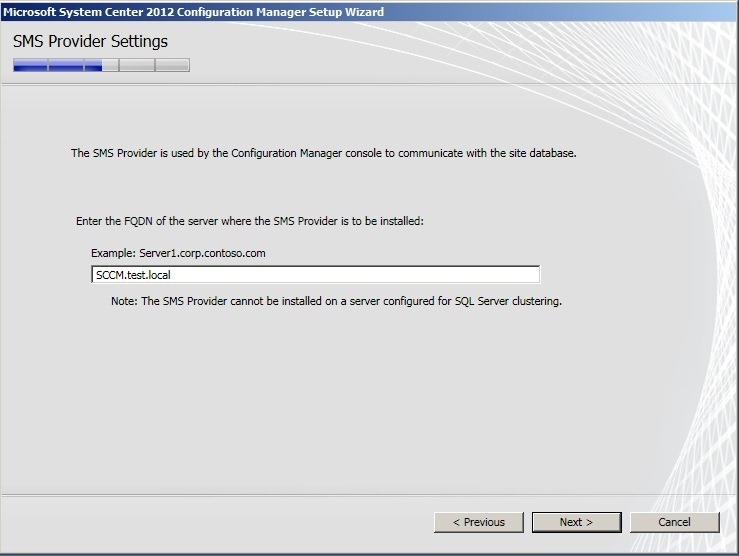 To check what version of SQL server you have installed start SMSS, and then click About on the Help menu. click Next and enter System Management as the value. 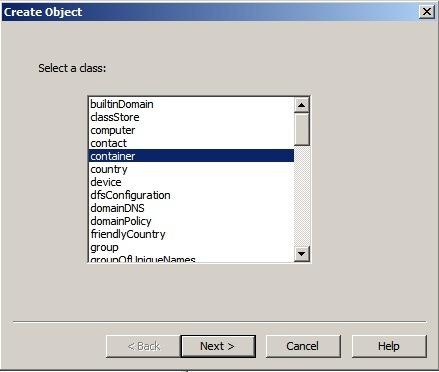 click next, select the 3 permissions General, Property-Specific and Creation-deletion of specific child objectsare selected then place a check mark in FULL CONTROL, and click next then Finish. after you have done this there will be generated a log file on your c:\ ExtADSch.log so please check this for error before continuing, if it is successful it should look like this. Now when you start the wizard, you have the option to download the prerequisites, I suggest you start by download those to a local folder on the server since we need them later in the setup. After they are downloaded continue with the install. In the site name just type something relevant, this information will also appear in the application web portal we are going to install later. Next, now its going to check the prerequisites. 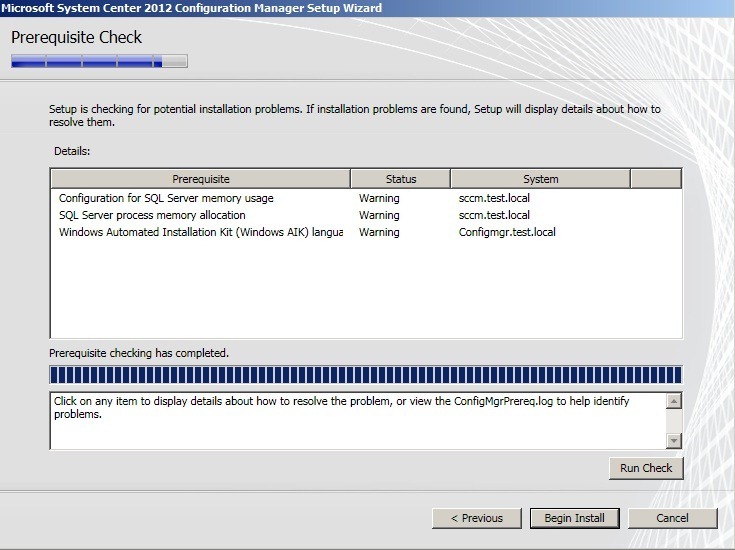 This consists of checking if the server has rights to publish information to AD, if the AD schema is populated with the new SCCM schema, if the SQL server is responding, if WSUS and/or AIK (You don’t need to have these installed since you might be using some other solution for patch management, so these will just give you a warning if you don’t have it installed) + some more. 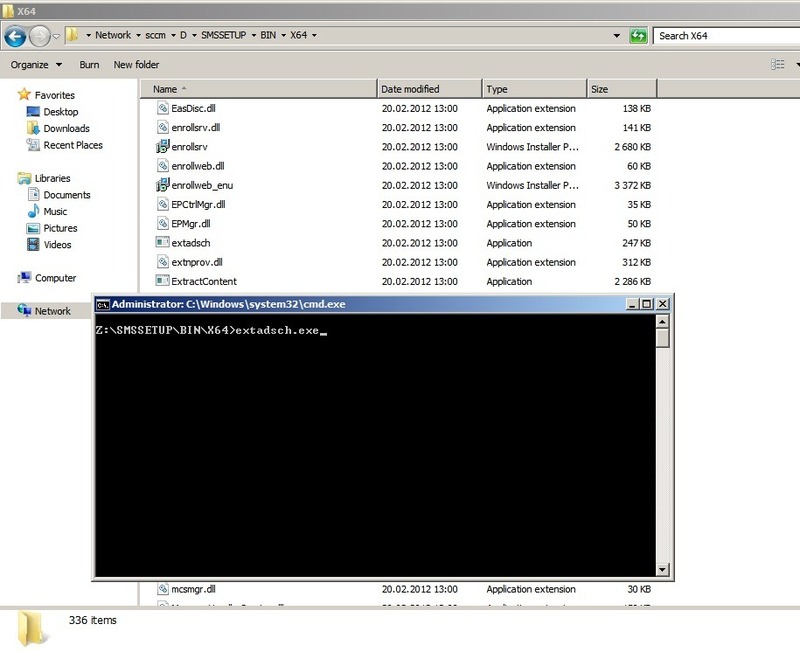 You can check the setup log file on C:\ drive and you can see what checks the setup does. Voila, installation if complete, if I check in Active Directory now you can see that it has automaticly published information about that site. PS: IF something went wrong during the installation doublecheck the log C:\ConfigMgrSetup.log it might contain information what went wrong. 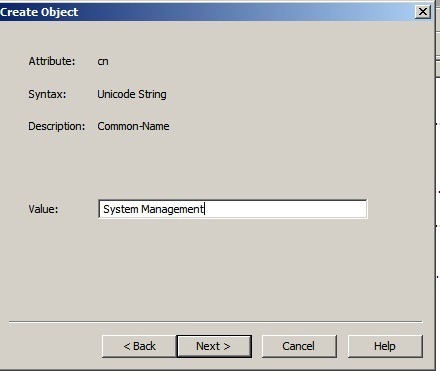 In case you might want to install cmtrace which is a log viewing tool which resides on the installation media of configmgr under Tools. 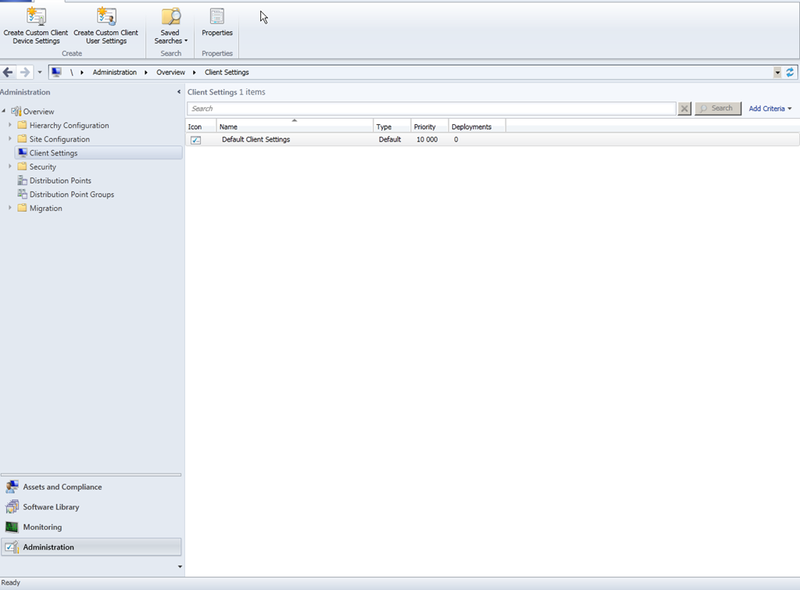 Now I can open the console so we can continue with the configuration, so stay tuned for part 2 of this SCCM blogathon.